I try to be fairly organized when posting southern grave information here, simply because I need an easy way to know what I've posted. So I usually try to complete an online tour of one cemetery in my photo database before I move on to the next. It doesn't always happen that way, to be sure, but I'm usually close. If you'll remember, I recently "finished" posting about Fairview Presbyterian Church Cemetery in Lawrenceville, Gwinnett County, Georgia. The next cemetery in my current working files is the Lawrenceville Historic (or Pioneer) Cemetery. 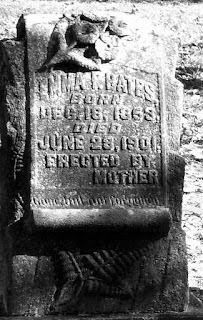 My first photo subject is the tombstone for Mrs. Emma F. Bates. She was born 18 December 1853 a daughter of James M. Orr and Mary Ann Cobb (both also buried in Lawrenceville Historic Cemetery). Emma died 28 June 1901, and her stone was erected by her mother who died less than a year later. When doing a little digging about Emma, I found that she too went "from Fairview to Lawrenceville." From Fairview Presbyterian Church to Lawrenceville Presbyterian Church, that is. Some information as to why another church of the same denomination was built can be found on the Lawrenceville Presbyterian Church website: "Lawrenceville Presbyterian Church was established in 1891 and was located on Oak Street in Lawrenceville on the old school house hill. We were established as a mission church of Fairview Presbyterian Church, the oldest church in what is now the Presbytery of Greater Atanta. We were established for the convenience of residents in Lawrenceville who found the drive to Fairview by horses and buggies, over rough roads and exposed to the weather, very difficult. Twenty six members withdrew from Fairview to form the Lawrenceville Presbyterian Church. There are many descendants of these charter members living in the Lawrenceville area today." 1. James C. Flanigan, Gwinnett Churches: a Complete History of Every Church in Gwinnett County, Georgia, with Short Biographical Sketches of its Ministers (1911); digital images, Ancestry.com (http://www.ancestry.com : accessed 24 June 2011).